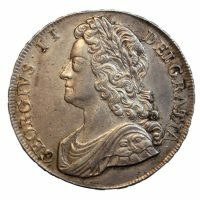 1738 Five Guinea, George II young head, reverse, crowned shield of arms, DVODECIMO on edge, S.3663a, extremely fine, rare year. 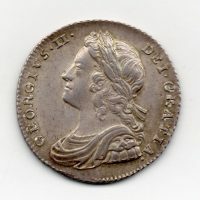 1727 Shilling, George II young laureate head, reverse, roses and plumes in angles, virtually uncirculated, rare. 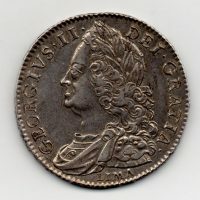 1732 Half Crown, George II young laureate head, reverse, crowned cruciform shields, roses and plumes in angles, SEXTO on edge, S.3692, extremely fine with attractive toning, this example has much eye appeal. 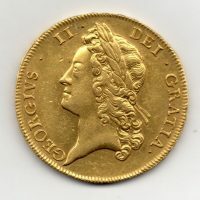 1746 Half Crown, George II older head, Lima below bust, reverse, crowned cruciform shields, DECIMO NONO on edge, almost extremely fine. 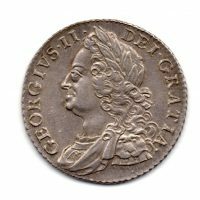 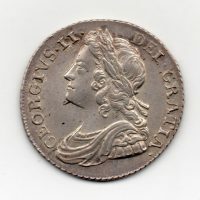 1737 Shilling, George II young head, reverse, roses and plumes in angles, virtually uncirculated, lustrous. 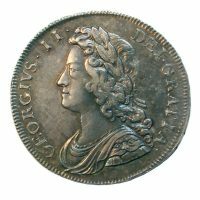 1741 Crown, George II young laureate bust, reverse, crowned cruciform shields, roses in angles, D.QVARTO on edge, good extremely fine. 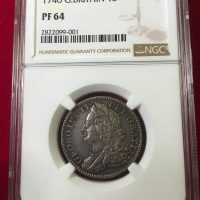 1746 Shilling, Proof issue, George II older laureate head, reverse, crowned cruciform shields, slabbed by NGC PF 64, very rare.